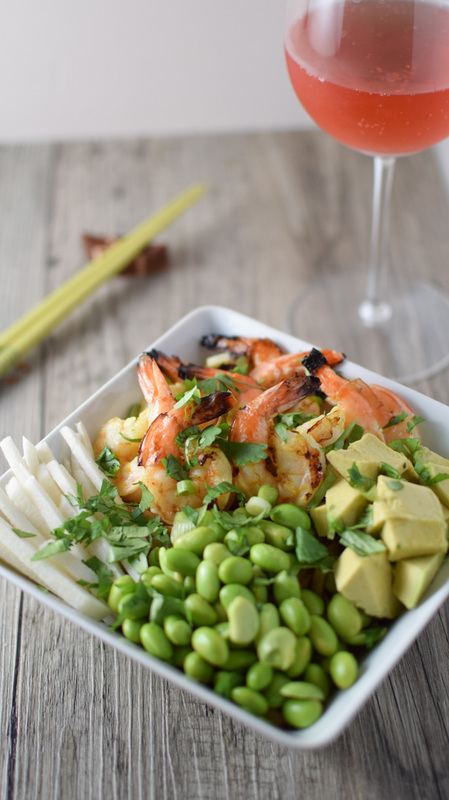 This udon noodle bowl is topped with grilled shrimp and a tasty miso sauce for a great weeknight dinner! This is shrimp and Udon noodle bowl is probably one of my bigger experiments to date! 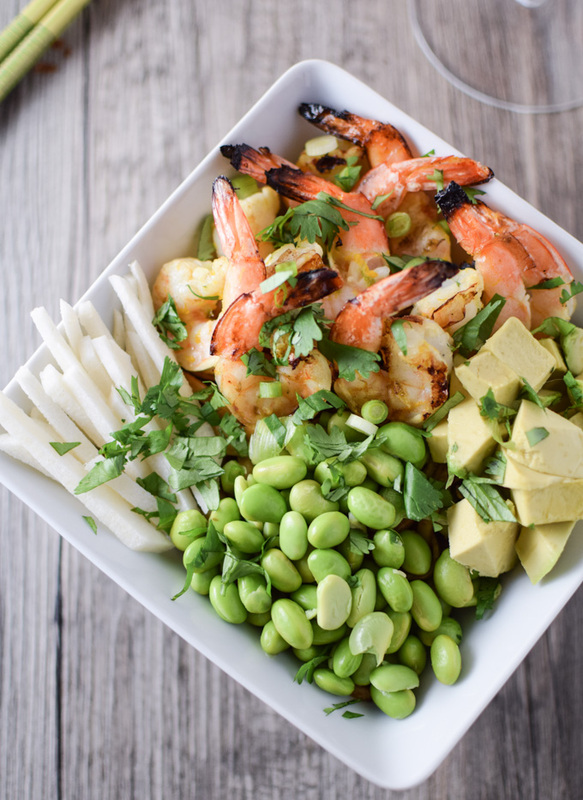 The idea started out as a salad, loosely based on a shrimp and white bean salad I had a few summers ago (stay tuned for a post that actually includes that recipe!). I decided I wanted to add a little more substance to it, so threw the Udon noodles into the mix and from there, just sort of went with it! When I’m working on blog posts I like to have tasters on hand, then I’m not just relying on my own opinion. Especially when I’m working with a new ingredient, which miso is for me. It’s been on my list of “things to make something with” for a while, so excited that I finally tried it and very happy with the results. For this recipe, a girlfriend of mine joined me and brought a lovely sparkling pinot noir that you see in the photo. It was a really good complement to the dish. A nice, not too sweet Pinot Gris would also work well to pair with this dish. The shrimp in this recipe are one of my favorite things to grill in the summertime. They come together quickly and are really easy to make; just keep an eye on them on the grill as shrimp don’t need much cooking time and can get overdone quickly! I often make just the shrimp for a quick dinner, or as an appetizer for a party. Combine tequila through orange juice in a small bowl, whisking together. Place shrimp in a small ziplock bag and pour in marinade. Place in refrigerator and marinate for 30 minutes. While the shrimp is marinating, prepare noodles according to package directions. Drain and set aside. To prepare the miso sauce, mix all ingredients but sesame oil in a small bowl until blended. Add sesame oil and whisk until combined. Heat 2 tbsp olive oil in medium sauce pan. Drop as many wonton strips as will fit into the pan; cook for about 20 seconds until strips begin to brown. Remove from oil with thongs and place on a plate lined with a paper towel to drain. Repeat with remaining wonton strips. Heat 1 tbsp olive oil in a medium sauté pan over medium heat. Add noodles and miso sauce. Using tongs to mix, sauté for 2 minutes. Keep warm. Remove the shrimp from the refrigerator and skewer, discarding any excess marinade. Place skewers on the preheated grill. Grill 3 minutes per side. Divide noodles between two bowls, top with shrimp and remaining ingredients. Can be served hot or cold. This sounds fantastic. I love all the flavors/ingredients in this. Pinned! I don’t know why I’ve never tried udon noodles before, but I feel I should correct that very soon. Those shrimp look wonderful! This looks great- I love dishes like this all summer long. Thanks. This looks like the perfect dinner for the heat wave we’ve been having in the northwest. I’ve never tried to make miso at home before. Pinning to try this later! My word how beyond delicious! Love this, so my kind of food. I use miso all the time including dressings, just the perfect flavour base. Also if your interested, I’d love it if you’d pop by our Meal link up party called Your Weekly Feed. We host every Sunday, sharing meal inspiration for the week ahead. Maybe link-up a scrumptious recipe or two.